A concert given by the BBC Symphony Orchestra on 6 January to celebrate Edward Gregson’s 70th birthday is to be broadcast on BBC Radio 3’s ‘Afternoon on 3’ on Tuesday 20 September from 15.00. British pianist Ronan O’Hora performs Homages, Edward Gregson’s rhythmic Concerto for Piano and Wind inspired by the piano concertos of Stravinsky, Bartók, Rachmaninov and Poulenc. The concert is conducted by Michael Collins. 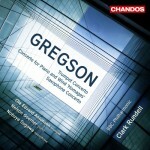 The Concerto for Piano and Wind has been recorded on the Chandos label, performed by the Nelson Goerner (piano) with the BBC Philharmonic, conducted by Clark Rundell.